Russian director feted by Hollywood is good news, but new law limiting transgender rights and exodus of Russian artists and intellectuals abroad are less cheerful signs, says Aliya Sayakhova. 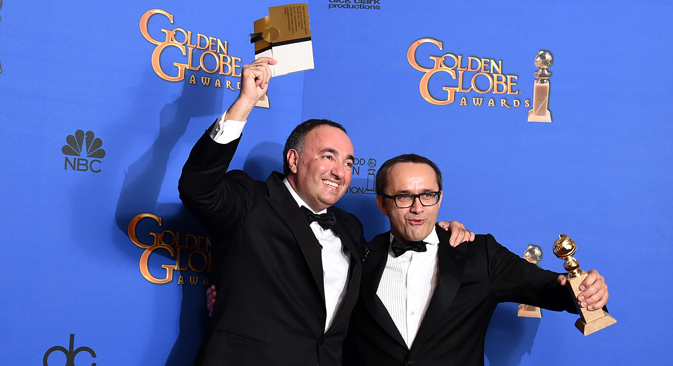 Let's start with the good news: for the first time in nearly 50 years a Russian film has won Hollywood's prestigious Golden Globe. The awards, organized by the Hollywood Foreign Press Association, feted Russian director Andrei Zvyagintsev, recognising his fourth feature, Leviathan, as Best Foreign Language Film at the Red Carpet event in Tinseltown January 11. "Leviathan from Russia, even though Lupita Nyong’o doesn't know how to pronounce it”, as the Guardian put it in its live feed on the award announcements. Leviathan, a grim take on modern Russia, in the newspaper’s words, has been racking up awards and recognition since it premiered in Cannes last May, where it won best screenplay. Zvyagintsev is now hoping to go for a second gold at the Oscars next month, where it is shortlisted in the best foreign film category. The last time a Russian film won both a Golden Globe and the Academy Award's famous statue was in 1969 when Sergei Bondarchuk's War and Peace won both. Based on the true (oddly enough, American Midwest) story of one man's hopeless struggle with the leviathan of cruel and rapacious bureaucracy and set in the stunning surrounds of Russia's Arctic coastline, the film has won plaudits from London to Toronto and Munich and many other festivals. International film trade bible, The Hollywood Reporter called it a "powerful, craftily allusive and elusive film, the director's best and most courageous so far", adding that it was "a thriller, a black social comedy, and a thinly-veiled swipe at Putin's regime in one tidy package." Russian audiences will have to wait until February 5 to see it as the film's producers delayed its domestic release to time it to the film awards season. Those lacking patience were briefly able to see it on an illegal torrents site, after a copy was leaked online. Commenting after its win, producer, Alexander Rodnyansky, told The Hollywood Reporter: "Leviathan represents everything that is important in Russian culture. It continues the tradition of great Russian writers and artists who have always spoken about the most important issues faced by our country even in the most troubling times. The other big story over the weekend was: "Transgender people in Russia banned from driving". "You must be joking," was my first response. Suspecting that current western prejudices might account for such bizarre headlines, I dug further. The media ferment was sparked by new Russian road safety measures stipulating medical impediments to driving. Designed to reduce Russia's frighteningly high annual death toll on the roads (30,000 dead and 250,000 injured), it lists physical and mental disabilities that are legal impediments to driving, including conditions such as visual impairment, epilepsy, paralysis, colour-blindness and schizophrenia. “But the most controversial section is the list of sexual preferences and conditions given, including paedophilia, sadomasochism and exhibitionism, as well as fetishism”, says the Guardian. The list is drawn from the World Health Organisation’s list of “gender identity disorders” and “disorders of sexual preference” and includes voyeurs, exhibitionists, transsexuals and transvestites among others. The Association of Russian Lawyers for Human Rights said the new law was discriminatory and unconstitutional, and would cause serious violations of human rights, reports the Independent. 'Small print' the British media seem to have missed is that only serious chronic and prolonged mental disorders with consistent and aggravating morbid manifestations will be grounds for disqualifying people from driving. “When the Russian government considered the list of medical contradictions for diving, they didn’t really have transsexual people in mind. They just put almost all the [WHO defined mental disorders] into this regulation”, Igor Kochetkov of Russia's LGBT Network said in a statement, calling the new law stupid, rather than an attack on gay rights. Driving difficulties may not force people to leave Russia, but the accumulating curbs on freedom of expression seems to be fuelling emigration. Artists and art activists are, according to The ArtNewspaper, fleeing to Berlin, Montenegro and Kiev in search of intellectual freedom. The prominent art publication, which was recently acquired by Russian investor Inna Bazhenova, ran two stories on the subject: one on Russian artists moving out of the country in search of artistic freedom, and another on prominent Russian art curator Marat Guelman heading to Montenegro. “I’m leaving so I can carry on working in peace”, Guelman said. The Montenegro project, located in Budva, an Adriatic resort popular with wealthy Russians and artists, will take three years to set up and will include an annual international open-air art event. I contacted Guelman directly to ask him if leaving Russia represented a defeat for him. “If I stayed I would have to cooperate with authorities, and I think under no circumstances should one work with the current regime”, he told me. “If I knew how to help my country, I would stay”. In 2013 Guelman was dismissed from as director of the contemporary art museum PERMM, situated in Perm, 700 miles east of Moscow, and later attracted the Kremlin's wrath exhibition “Welcome! Sochi 2014." Asked whether art should always provoke, he says simply: “To be provocative is art’s inherent feature and not an aim."